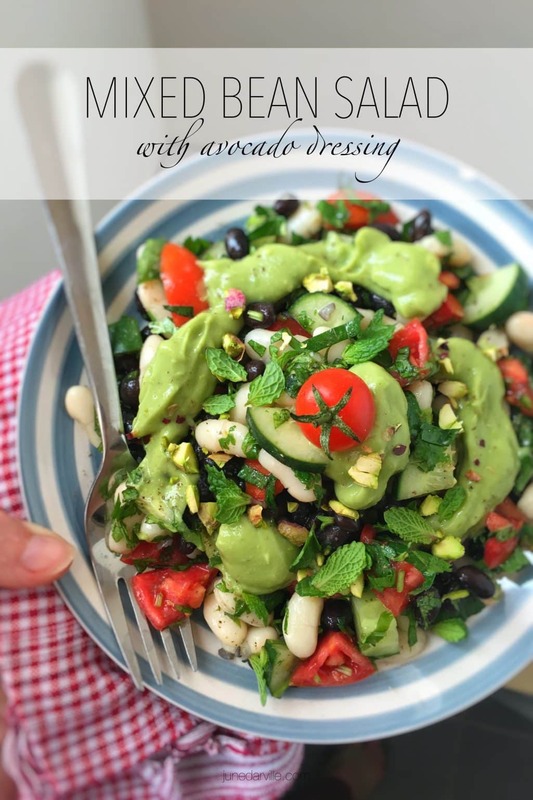 Avocado Dressing for Mixed Bean Salad | Simple. Tasty. Good. I waited for too long to use an avocado that was laying in my pantry. The day that I wanted to make a chunky tuna salad with it again, it was too late because the avocado was just too soft and too ripe to chop it up nicely. I used it anyway, only I made a creamy avocado dressing with it. And that turned out to be a great idea in the end! And the avocado dressing looks spectacular as well, especially on top of this colorful mixed bean salad. It was a great lunch salad, I can tell you that. Nice and fresh flavors, lots of crunchy bits and then that creamy dressing on top. It was only after devouring this salad that my husband said: hey, that’s another dish for your vegan recipes chapter! Love cooking with avocados? Then also check out another favorite: my super creamy avocado soup with shredded chicken and basil pesto! A bunch of beans and vegetables topped with a layer of this gorgeous creamy avocado dressing... What a great lunch idea!! Pour the canned beans in a sieve or colander and rinse them well. Let the beans drain for a couple of minutes and then transfer them to a large mixing bowl. Chop up the ripe tomato and the cucumber and then add this to the beans in the bowl. Stir well. Then chop up the fresh cilantro and mint. Add it to the bowl as well. Drizzle with 2 tablespoons of olive oil. Season with a little pinch of pepper and salt to taste. 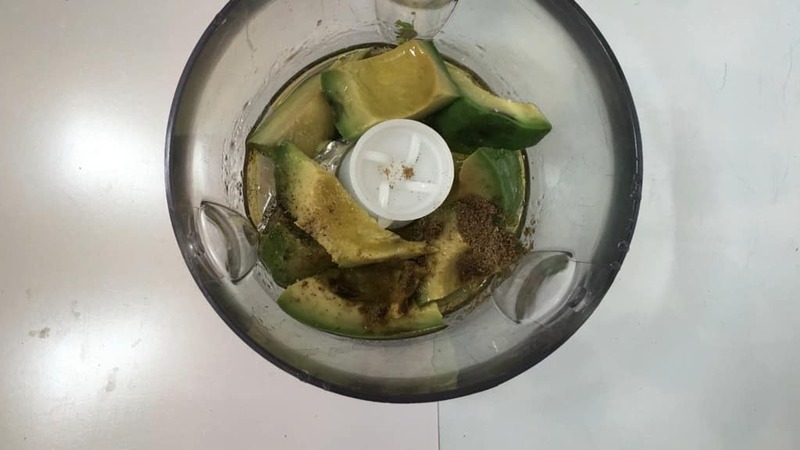 Add the avocado to a blender together with a tablespoon of the olive oil, the ground coriander, ground cumin, a pinch of salt and pepper, the lemon (or lime) juice and 5 tablespoons of water. 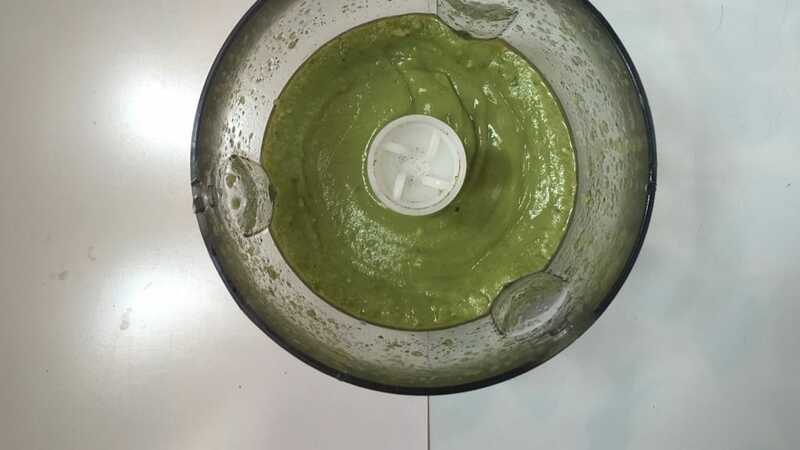 Blend the ingredients well until you get a creamy and smooth avocado dressing. Then check the seasoning and add extra spices to taste if necessary. 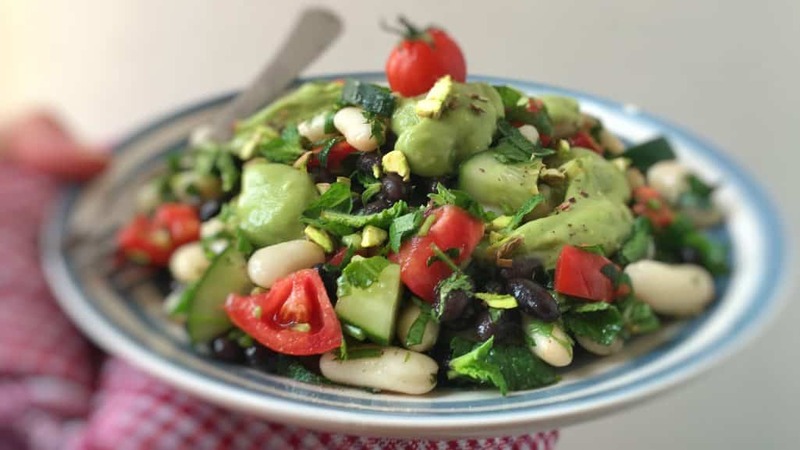 Divide the bean salad over 2 plates or serving bowls and scoop the avocado dressing on top. Garnish with the crushed salted pistachio nuts. Serve immediately! 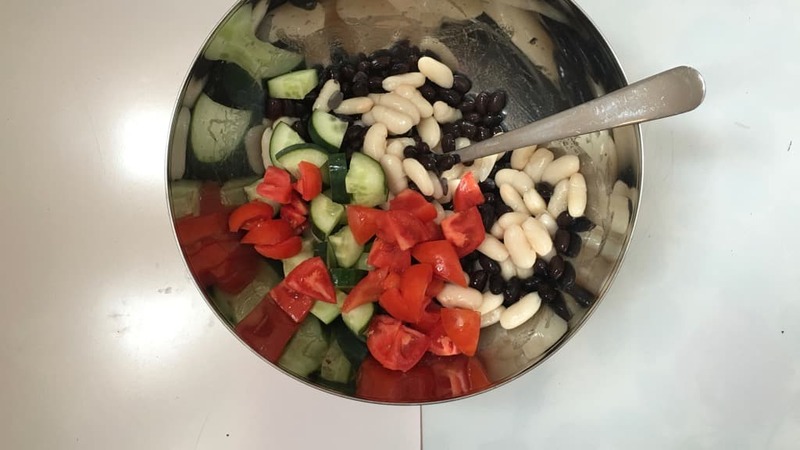 Do you love bean salads? Then I have two more recipes for you to try out! Fresh, exotic and crunchy… this Mexican bean salad has it all! 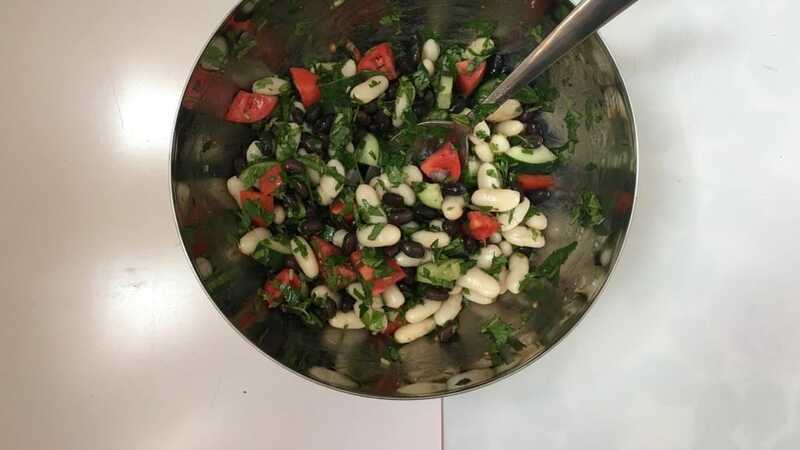 Very often I pull out this bean salad recipe. 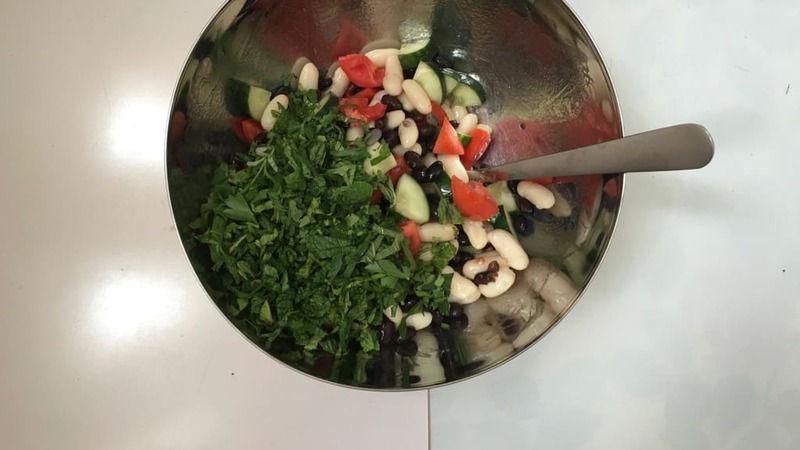 That’s when I’m looking for a quick and easy side salad with punch because this salad contains the most incredible flavors: fresh bell pepper, sweet corn, crunchy red onion, zesty lime juice, hot sauce, fresh cilantro and garlic. It is better to make this salad in advance and keep it in the fridge until dinner time because it’s got raw garlic in it. When the salad is resting, the flavors have enough time to develop fully or you might end up with a mouthful of lovely vegetables but raw garlic as well. Stir this salad a couple of times while it is resting. Check the seasoning once more right before serving. Yum! 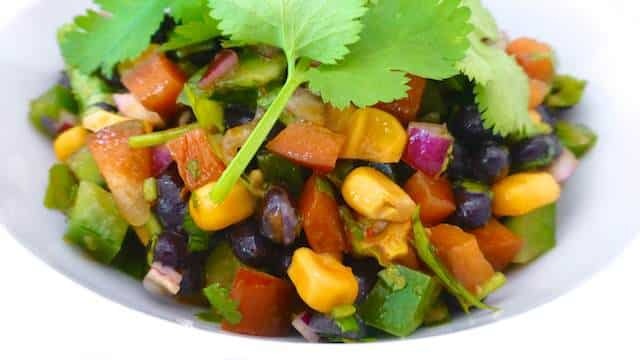 Mexican bean salad: corn, bell pepper, black beans, hot sauce, lime and cilantro... Fresh, exotic and crunchy… this salad has it all! Clean the red bell pepper, remove the seeds and then dice it very finely. Add it to a large mixing bowl together with the drained black beans. Peel the red onion and chop it up finely. Clean the green bell pepper, then remove the seeds and dice it up as well. Add this together with the chopped red onion to the bell pepper and beans in the mixing bowl. Then add the drained corn and the garlic. Sprinkle with half of the lime or lemon juice. Stir the salad well. Add the olive oil. Chop the fresh cilantro finely and add it as well. Season with a little salt. Add the hot chili sauce. Stir the salad well. Then check the seasoning and add extra hot chili sauce, salt or lime juice to taste if necessary. Let the bean salad chill and rest in the fridge for at least 30 minutes until dinner time. Stir the salad a couple of times while it is resting. Check the seasoning once more right before serving. Serve cold. And here’s a third bean salad! I assembled this tuna bean salad really by opening every cupboard in my kitchen, going through every shelf in my pantry and rummaging around in my fridge. I saw the can of beans. In it went. Canned tuna! In. A handful of leftover arugula in the fridge. Come on in. A chunk of red onion. Welcome! Guess it only took about 10 minutes to prepare it including shooting every step. Ut in the end this salad was just delicious. I love the combination of the flaked tuna and the beans. I’m using borlotti beans here but you can add whatever canned beans you got, even chickpeas would be great! 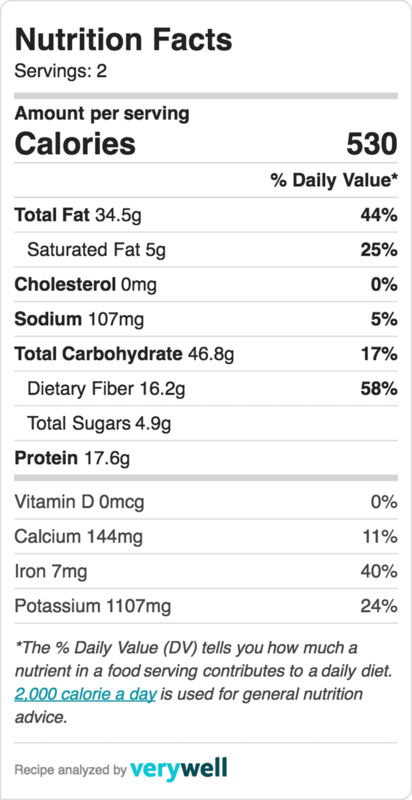 Love quick and easy salads with canned tuna? Then also check out my creamy avocado and tuna salad with black beans! Pretty similar to my mixed bean salad with avocado dressing right on top of this page, except for the canned tuna of course! Worth every second of your time, you will love that one as well. Or how about my tuna salad stuffed avocados then? 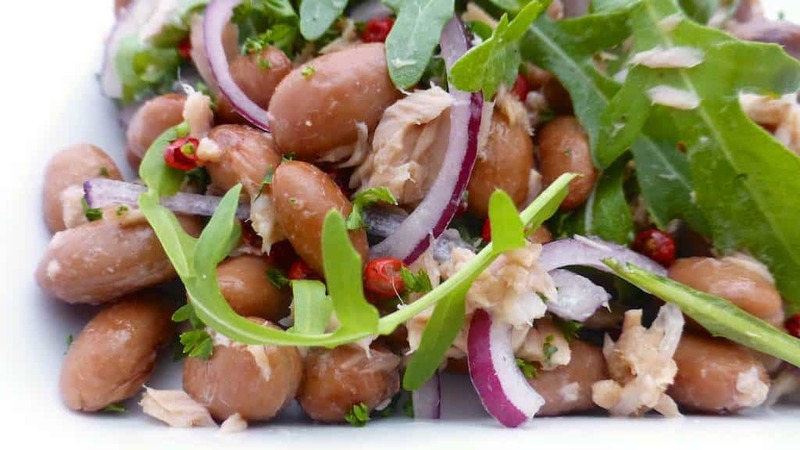 But back to this tuna and bean salad with arugula! Enjoy this one! Here is a quick and easy tuna bean salad, a perfect summer side salad! I love the combination of the flaked tuna and the beans. Open the can of beans and pour it all in a large sieve or colander. Rinse the beans gently and then let them sit there for a couple of minutes until drained. Transfer them to a medium mixing bowl. Drain the canned tuna and flake it up a bit using a fork. Then add the tuna to the beans in the bowl. Chop the red onion into thin slices and add them together with the arugula salad to the bowl as well. Stir all the ingredients until well combined. Then season with a little pinch of pepper and salt. Drizzle with the lemon juice (or vinegar). Add a good splash of the olive oil and the pink pepper. Stir the salad well again. Then check the seasoning of the bean salad and add extra pepper, salt, lemon juice (or vinegar) or olive oil to taste if necessary. Place the salad in the fridge for another 10 minutes until chilled. Serve.